Halco Lighting ProLED® 7-Watt PAR20 E26 Medium LED lamp offers 525-Lumens light output. It has color rendering index of 90. Lamp with 5000K color temperature rating radiates white light to the surrounding. Lamp in white color, has aluminum base and reflector. Lamp has voltage rating of 120-Volts. It measures 3.39-Inch x 2.5-Inch Dia. 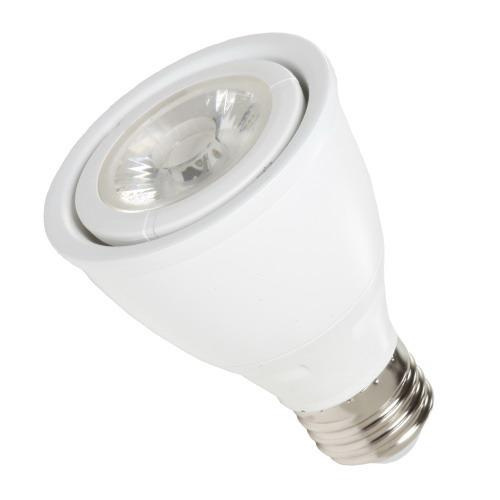 This dimmable lamp has efficacy of 75 LPW and comes with average life of 25000 hours. It offers narrow floodlight distribution at beam angle of 25-degree. Ideal for accent, display, education, healthcare, hospitality, office and retail. It is IP65 rated for degree of protection. Lamp is cULus listed and Energy Star certified.